The Land & Garden Preserve is excited to announce the 2018 visitation schedule for the Abby Aldrich Rockefeller Garden. Thanks to David Rockefeller, Sr.’s bequest, the Preserve assumed ownership of the Abby Garden in December 2017. The Preserve is honored to take on responsibility for this historic property and looks forward to welcoming visitors. For many years during the summer, the Rockefeller family generously opened the Abby Garden to the public each Thursday. The Preserve is committed to continuing and expanding that tradition. The goal is to increase access to the garden while upholding the historical high standards of operation. Sustaining the beautiful, peaceful, contemplative space that the Rockefeller family cultivated for decades will be a priority. Directors of the Preserve regard 2018 as a transition year and will be experimenting with ways to carry out the new responsibilities. 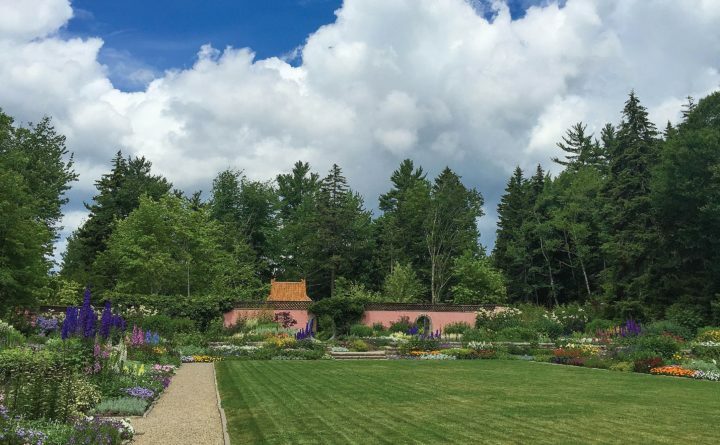 During this summer, from July 10 through September 6, the Abby Garden will be open to the public on Tuesdays and Thursdays from 10 a.m. to 12 p.m. and 1-3 p.m. In addition to the walled garden, visitors will have access to the Eyrie Terrace, the former home site of John D. Jr. and Abby Rockefeller. The Terrace provides a spectacular view to the outer islands and the Atlantic beyond them. As in the past, reservations are required. Tickets are $15 per person and $10 per person for year-round MDI residents, full-time students, active military, and seniors (65 and older). Children under age 12 are admitted free but will require a reservation. Beginning June 1, reservations and ticket purchases can be made through the Preserve’s website at www.gardenpreserve.org/abby-garden-reservations. A new Preserve-wide membership program will be offered in the fall. The program will include membership benefits for all the Preserve’s properties including the Abby Garden, the Asticou Azalea Garden, Thuya Garden & Asticou Terraces, and Little Long Pond lands and trails. The Land & Garden Preserve is a non-profit organization located in Seal Harbor and Northeast Harbor, Maine. The Preserve’s mission is to share the beauty of historic lands and gardens on Mount Desert Island. The lands and gardens managed by the Preserve are open to the public. For more information, contact the Preserve at 207-276-3727 or gardenpreserve.org.